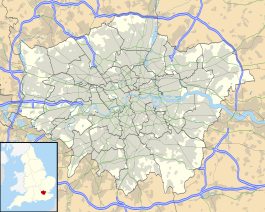 Becontree is a London Underground station on Gale Street in the Becontree neighbourhood of the London Borough of Barking and Dagenham in northeast London, England. The station is on the District line, between Upney and Dagenham Heathway stations and is in Travelcard Zone 5. The station was originally opened as Gale Street Halt in 1926 by the London, Midland and Scottish Railway on the existing route from Fenchurch Street to Southend. The station was renamed and completely rebuilt in 1932 with an additional pair of platforms to serve the electric District Railway (now the District line) local service. National rail services ceased to call at the station since the 1960s, leaving only two platforms in operation. The station is located on the west side of Gale Street. It serves the residential area of Becontree, which is to the north of the station. There is a commercial area to the south of the station, while Parsloes Park is to the north. Nearby landmarks include a driving school, the Jo Richardson Community School, Roding Primary School and The James Campbell Primary School. The railway here was crossed by Becontree Estate Railway, a temporary railway constructed as part of the building of the Becontree housing estate which operated between 1921 and 1934. Becontree estate was constructed in the 1920s by C. J. Wills and Sons Ltd., with the remainder completed in 1938. The estate was once to be served by high speed tramways, with services starting from Ilford, branching out into the estate and then rejoining the current line to Barking. This was not supported by Ilford and Barking councils, and was abandoned due to problems with Ilford authorities and the need to electrify the Barking to Upminster line. There was also a deferred plan for a Kearney Monorail tube connecting Becontree to the city. Becontree in 1961, with the former LT&SR tracks and platforms in the foreground. In 1858 a line through East Ham was constructed to provide a faster connection between Barking and the city of London, which connects to the London and Blackwall Railway route to Fenchurch Street. Between 1885 and 1888, the London, Tilbury and Southend Railway (LT&SR) constructed a line between Barking and Pitsea via Upminster to provide a more direct route between the two cities. The station was not built at the time. The London, Midland and Scottish Railway (LMSR) took ownership of the LT&SR in 1923 and the station opened as Gale Street Halt on 28 June 1926 to serve the new Becontree Estate and subsequent residential areas. Initially, there were no roads leading to the station. In 1929, the company proposed quadrupling their line between Barking and Upminster and electrifying one pair of tracks for the District line. [note 1] The station was rebuilt and new platforms were constructed for the new pair of tracks. Gale Street Halt was renamed as Becontree and the new station building to the designs of the architect William Henry Hamlyn opened on 18 July 1932, with electrified District line services starting operation 2 months after on 12 September. In addition to the start of electrified services, two new adjacent stations on the District line named Upney and Heathway (now Dagenham Heathway) opened. The slow tracks on the former LT&SR line to Upminster were shared with steam locomotive hauled goods and passenger services, until 1961 when the District line took over exclusive use of the DC electrified lines. LT&SR services ceased to stop at the station on 15 June 1962. Westbound platform looking east, with the fenced off LT&SR platform visible to the right. The station has four platforms, of which two are used by the District line and another two are disused since the LT&SR service was withdrawn in 1962. One of the platforms is fenced off from the westbound District line platform. The single-storey brick station buildings are of typical 1930s design which are also constructed at Dagenham East, Hornchurch and Upminster at the time. Station refurbishment works were completed by Metronet in 2006, where heritage features were restored, CCTV equipment replaced and PA system enhanced. New wall tiles and ceilings were clad, and new tactile strips, customer Help Points and better lighting were installed. Whilst these works were done between 2005 and 2006, the station was closed on several weekends whereby replacement buses operated to Dagenham Heathway station. London Bus routes 62 and 145 serve the station. The station is said to be haunted by a faceless woman with long blonde hair that several staff members have sighted. ^ Government assistance was provided for these works, under the Development (Loan Guarantees and Grants) Act, 1929. ^ Lord Ashfield was initially concerned about the difficulty in generating revenue from this line but was impressed by the actual turnover. Patronage was increased by 40 per cent on the Upminster line while other lines increased by a mere 26 per cent. ^ "Becontree tube station" (Map). Google Maps. Retrieved 6 December 2018. ^ McCarthy & McCarthy 2009, p. 6. ^ a b c d e Jackson 2018, pp. 291–311. ^ "The London, Tilbury and Southend Railway" (PDF). Local Studies Information Sheet No. 10. London Borough of Barking and Dagenham. Archived (PDF) from the original on 23 October 2015. Retrieved 23 October 2015. ^ a b Horne 2006, p. 61. ^ Lawrence, David (2018). British Rail Architecture 1948–97. Crecy Publishing Ltd. p. 20. ISBN 9780860936855. ^ a b Feather, Clive. "District line". Clive's Underground Line Guides. Archived from the original on 3 June 2015. Retrieved 28 June 2015. ^ Jarrier, Franklin. "Greater London Transport Tracks Map" (PDF) (Map). CartoMetro London Edition. 3.7. Archived (PDF) from the original on 18 November 2018. ^ Crookston 2013, p. 31. ^ Horne 2006, pp. 80–82. ^ a b Brailsford, Martyn (2016). Railway Track Diagrams Book 2 Eastern. Frome: Trackmaps. p. 3. ISBN 978-0-9549866-8-1. ^ a b Brown, Joe (2015). London Railway Atlas. Hersham: Ian Allan. pp. 27–30, 43–46. ISBN 9780711038196. ^ "Station Refurbishment Summary" (PDF). London Underground Railway Society. July 2007. Archived (PDF) from the original on 23 October 2015. Retrieved 23 October 2015. ^ "Refurbishment Work to Improve Becontree station" (Press release). Transport for London. 27 October 2005. Archived from the original on 1 February 2019. Retrieved 1 February 2019. ^ "Buses from Becontree" (PDF). Transport for London. 30 September 2017. Archived (PDF) from the original on 18 December 2018. Retrieved 18 December 2018. ^ Heffernan, Mike (12 September 2008). "Ghosts on the London Underground". Archived from the original on 6 December 2018. Retrieved 6 December 2018. Wikimedia Commons has media related to Becontree tube station. Crookston, Martin (4 December 2013). Garden Suburbs of Tomorrow? : A New Future for the Cottage Estates. Routledge. ISBN 978-1-3178-2147-2. Jackson, Alan A. (2018) . Semi-Detached London: Suburban Development, Life and Transport, 1900–39. Routledge. ISBN 978-1-35117-512-8. This page was last edited on 13 March 2019, at 00:04 (UTC).